NOT PERSONALIZED WRITE - "NO"
Handmade wooden Docking Station is a great gift for men. Our wooden docking station has a unique design and is very easy to use as a charging station. This position consists of two parts, you need only to insert them into each other, and he is ready to save your lovely gadgets. 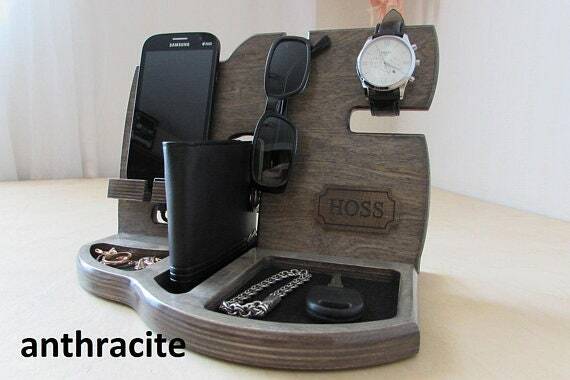 This dock can accommodate your Apple Watch and any iPhone or any other Smartphone brand that we have on today's market such: iPhone 4, 5, 6, 6 PLUS, 7 and 7 PLUS and Samsung Galaxy, Nokia, Nexus etc. This model has been cut from high-quality birch plywood . All parts of its excellent and beautifully detailed, carefully sanded and hand painted with acrylic lacquer. Each dock/holder is unique because of wood grain. Personalized Docking Station is a perfect original handmade gift for men, father, brother and Boyfriend. NOTE: Due to grain and color variances between different boards, the color and grain figure of your item will differ slightly from the item pictured. This dock/holder does not come with charging cord, you have to use your existing charging cord. We use PayPal as a payment method on Etsy. Before sending the order, carefully check the spelling by copying and pasting the provided text. Once we have received your order, we usually process and ship it within 4-8 business days. Dates for the processing and delivery of custom orders will be agreed with you individually and will depend on the number and complexity of the manufacturing order. Please keep in mind that the post office services are generally slower during big holidays like Christmas / Easter etc. due to increased traffic. Please note, If you wish to cancel transaction (before the order was made and sent), that there is non-refundable 10%. We package all orders very carefully however sometimes damage can occur in transport, we’ve no control over this. If for some reason something arrives damaged, please send us a photo of the damaged item and packaging within 14 days of receipt. We will be sure to issue you a refund or replacement, whichever you prefer. If you wish to cancel transaction (before the order was made and sent), plaese, note, that there is non-refundable 10%. All custom orders, including a personalized engraving items, are non-refundable. We’ve no control same force majeure (sometimes weather will delay packages). In such cases we are not responsible. Packages returned to us because of incorrect address or unclaimed, will be refunded minus the shipping taxes. In any case feel free to contact with us so we can come up with a solution. If you have any question regarding this item or any other item from my listings, please feel free to ask me and I will respond to your question same or next day. Thanks for visiting my online Etsy store and have nice day!! I bought this product for my dad, and it ended up getting here a lot quicker than I thought! It’s beautiful and my dad loves it! Thank you! Edit: just found out that it didn’t have the initials I paid for , but the shop owner had no problem helping with the problem! Great service.